A Lead in a marketing context, is a potential sales contact, an individual or organization, that expresses an interest in your products or services. Leads are typically captured through the referral of an existing customer, or directly through the company website (Using Web-to-Lead), etc. Usually, Leads are converted when they have been identified as qualified sales prospects. A Web-to-Lead Form is an essential component of marketing and sales automation. The Form is placed on a public website where you generate Leads from prospective customers who visit the site. From past couple of years, Salesforce has provided an out-of-the-box, Web-to-Lead feature to their customers. It is quite easy to setup and customize web form to capture leads for your organization. But what about SPAM prevention? Spam is a method of submitting unwanted information to web forms. Unwanted information may be advertisements, links to offer pages, phishing URLs, and abusive texts. Spammers create bots to automatically find web forms and post advertisement links. Where is Spam coming from? Bots – automated software which will enter details in your forms on a rapid and mass scale. Human – people deliberately entering fake details, either because they are time wasters or trying to sell something. Until now, we have been using Validation Rule, Antispam question (something like What is 4+2? ), etc. In Spring’17 release, Salesforce has added one exciting feature – Web-to-Lead: reCAPTCHA Web Form Validation. Now it is possible to add Google reCAPTCHA to your Web-to-Lead Form using few clicks; code is no more required to implement it! 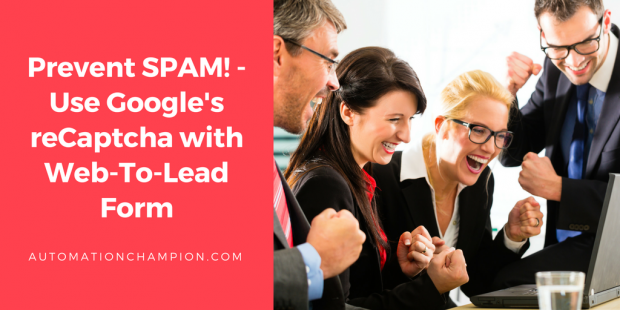 Protect your site from spam and abusive activities by adding Google reCAPTCHA V2 to your Web-to-Lead Form. Let’s start with a use case. Kristen Flanagan is working as a System administrator at Gurukul on Cloud. A month back, she has started her new job after completing Administrator certification. She received a requirement from her manager stating that, stakeholders are planning to capture Lead from the corporate website. For this, they want to use out-of-the-box Web-to-Lead Form. She also received a related requirement requesting her to enable spam filtering for the form. Very first thing you need to do is register your website (gurukulOnCloud.com – where you are planning to host the Web-to-Lead Form) on Google reCAPTCHA to get the Site and Secret key. You can put anything on Label field as it is just for your notes. For current scenario enter Gurukul On Cloud Web-to-Lead as Label. The next step is to choose the type of reCAPTCHA. For current scenario select reCAPTCHA V2 – it validates users with the “I’m not a robot” checkbox. Then you have to enter the domain name. This is simply asking you where are you planning to post your Web-to-Lead Form. For current scenario, we are going to host the Web-to-Lead Form on gurukulOnCloud.com, and then, use gurukulOnCloud.com as a domain. You can list more than one domain (one per line) without http(s)://. Also, keep in mind that your domain should end with TLD ( .com, org, .net) for example – gurukuloncloud.com/contact would be invalid and correct domain would be – gurukuloncloud.com. Make sure to select the checkbox Accept the reCAPTCHA Terms of Service. Read the rest of this entry!